When Dr. Mark Hyman first saw Isabel, ten years old at the time, she had a severe case of an autoimmune disease, classified as a mixed connective tissue disease. The MCTD diagnosis includes rheumatoid arthritis, systemic lupus erythematosus, and other similar diseases with extremely debilitating side effects that can drastically reduce the quality of life. The disease is deemed to be incurable. As shown in the picture above, the disease affected her whole body from top to bottom: blood vessels, white and red blood cells, liver, and muscles. 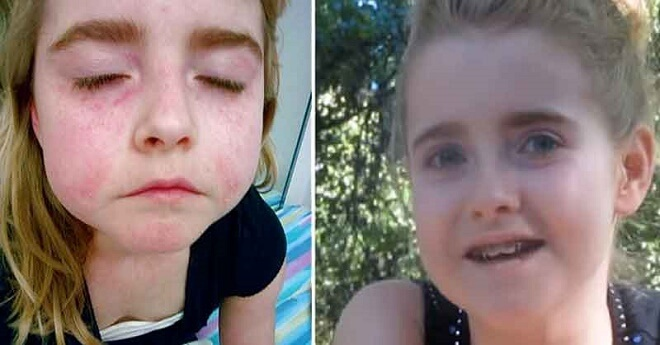 Her skin was inflamed, and face and joints were swollen. Isabel came to him on steroids, aspirin, and acid blockers, and was chronically “tired and miserable,” writes the doctor in the Huffington Post. And just like with the case of pop singer Selena Gomez's lupus treatment, Isabel was recommended to take a chemotherapy drug to suppress the activity of her immune system daily. None of the medications were making her any better, and her former doctors wanted to put her on a TNF-alpha blocker – an immune suppressant that may reduce some symptoms, but adds a great risk of cancer and death from the infection. Refusing to accept that as her fate, she was brought to Dr. Hyman and less than a year later, she was symptom-free. Her blood tests were normal and she was off all her medications. What Dr. Hyman did was simple, yet remains a mystery to most modern MDs trained in medical schools through curriculum heavily slanted toward the pharmaceutical industry. Instead of covering up the symptoms with drugs, Dr. Hyman found the underlying causes of her condition – inflammation in her body. Medical treatments differ depending on the disease but often include immunosuppressant drugs, pain medications, hormone replacement therapy, and anti-inflammatory drugs, according to Healthline. But as we see with Isabel's case, these type of interventions do not work for everyone, and even when they do work, they have many side effects. Dr. Hyman writes that in the past, doctors made observations and recorded the results of how their patients responded to the chosen treatment plan. These records were published as “case studies” and shared with other doctors. Unfortunately today, even the most successful case studies are brushed off as “anecdotes” and are not taken seriously. As the result, millions of patients may be prevented from receiving the treatments they need because of the lack of randomized controlled trials of these treatments (the only evidence mainstream medicine takes into consideration). “[M]edicine today approaches most disease by suppressing, covering over, blocking, or otherwise interfering with the body's biology. We generally do not attempt to seriously address the underlying problems that lead to the disease in the first place,” writes Dr. Hyman. What he recommends instead is functional medicine. Functional medicine is a fairly new global movement that instead of just looking at the symptoms, takes into consideration the synergy of the whole body and its interaction with the environment. Its goal is to restore balance in the body as a whole instead of focusing on one organ or one issue. To learn more about it, you can look at the programs by The Institute for Functional Medicine and check out this textbook recommended by Dr. Hyman in his blog – Textbook of Functional Medicine. Dr. Hyman lists a few steps to consider in order to treat an autoimmune disease. First of all, any hidden issues in the body need to be addressed: yeast infections, viruses, bacteria, or Lyme disease. Second, it is important to check for any allergies, gluten and dairy being the two most common ones. Then, the person should get a heavy metal testing, especially for mercury. Mercury can enter the body from flu shots, fish, amalgam fillings and other sources.